Do you feel an uncontrollable urge to eat even when you are full? You do not always want to eat just because you are hungry, sometimes it is an unconscious reaction of the brain. Here are the 6 reasons that push to eat, even when you have recently eaten. Eating is one of the pleasures of life, but to avoid problems of health and figure it is necessary to do it in a healthy way. However, we do not always find ourselves eating food only when we are hungry, often the desire to nibble something is just an unconscious brain response to a devious and deceptive stimulus. Here are the 6 reasons that push you to eat even when you are already full. 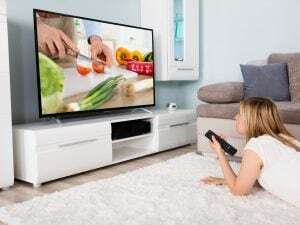 Watching cooking TV shows – The dishes prepared on TV are not always healthy, they often contain a high quantity of fats and calories, putting your figure at risk. It is no coincidence that those who often watch culinary programs gain more weight more easily than those who do not see them. Feeling attracted to red and orange foods – People unconsciously tend to choose bright-colored foods because they think that they contain more vitamins and minerals. But better not to focus on fat and caloric dishes such as chips and nachos that are definitely unhealthy. Watching food packages on the counter – Watching food on the table or on a bar counter triggers an unmotivated appetite in us. It is as if you could not resist the temptation to eat that food, but this just put your figure at risk. So it is better to put all the purchased products on the shelves immediately after returning home. Look at other people who eat – Usually you can’t resist in front of a dish ordered by some friends, even you have already eaten. Even if you are already full, you feel a sudden hunger. The reason? The brain tends to adapt to the rhythm of the people around it, to make the situation more reassuring. Use large dishes – When using large plates, you are unconsciously brought to eat more to finish off all the food in them. The fault is in the eyes that make the brain think that those portions are smaller than they appear. Feeling happy – Despite what you may think, you do not consume more food just when you are sad. When a person feels happy, he also tends to eat more, and the reason is quite simple. You do not pay attention to the calories you take, and you eat whenever you are hungry.